Gone are the days of “I know more than you”, an inherent characteristic in the old school East-West exchange, utters Indian choreographer Vikram Iyengar. 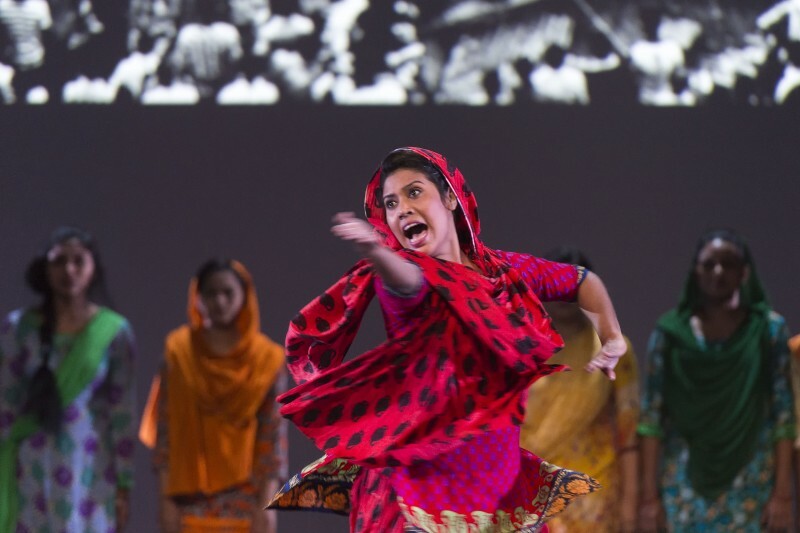 Invited by German director and dance-maker, Helena Waldmann to be the co-choreographer for the piece “Made in Bangladesh,” the Kathak trained performer embarked on a collaborative journey in mirroring striking realities between the sweatshops of the garment industry and that of the artistic practice. “Made in Bangladesh”, which premiered in Ludwigshafen in November 2014, adds up to the sociologically charged body of work of Helena Waldmann. Habitually sensitizing and decoding global issues through dance-theatre, the Berlin-based choreographer has engaged in numerous projects in the Middle East, Latin America, Asia, and Africa. In approaching her latest work, she braved a less familiar territory by employing one of India’s classical dance forms, Kathak, contained within a volatile story of sweatshops. It is known that Kathak is derived from the word “katha”, meaning “the art of storytelling”. Owing great sensitivity to cultures while maintaining critical distance, Helena realised her vision for “Made in Bangladesh” with Vikram, along with 12 Kathak dancers from Dhaka, in exploring the malleable and evolving dance movement. Vikram, an active promoter of Kathak, shares his views with ASEF culture360 about the space for interaction in making and touring of “Made in Bangladesh”. VB: What was your initial impression when Helena Waldmann invited to collaborate? What lured you into it? What was it that you wanted to achieve as a choreographer or as a Kathak performer/scholar? And at the end, what would you say was your take away? VI: I first met Helena at a café in Berlin in November 2013. She had no idea that I was a Kathak dancer-choreographer. Her husband Arnd introduced me to her as a dance writer – one of my minor identities. She was interested in meeting someone from the region to get a sense of what it would be like to work in Bangladesh. She had not worked in South Asia before, so a conversation with a dance writer from India seemed like a good idea. After researching the kinds of dance which were available in Bangladesh, she decided to use Kathak. She was very clear that she did not want to impose a form, but work with local forms as a tool to create a contemporary performance piece. During the conversation, she discovered my dancer-choreographer identity. Then we got into the technicalities of Kathak that she wanted to use, and the opening idea she had of the footwork already exists in a different version in one of my productions from 2003 – Shunya Se. On the spur of the moment, she offered me the role of co-choreographer – literally over a cup of coffee! It took a couple of more conversations and viewings of my work at her home and over Skype to finalise matters. But it was decided within a week, and I was in Bangladesh to conduct auditions the following month. 2013 was the year I branched out from my own company to do more freelance work. I was in Berlin on an arts management Fellowship, and already had two more personal performance projects for 2014. As far as my relationship with Kathak, I am actively searching for inspirations and impulses from the outside – from those who may not be from the Kathak world – which can trigger new discoveries and ways of perceiving the form. So I was in a phase where I was ready to accept challenges outside of my comfort zone. Helena’s offer came exactly at the right time. I have always been interested in playing with Kathak. I have never held it sacred in a reverential manner that doesn’t allow a full openness of mind, and am very happy to break it up and reconstruct it, exploring different ideas and impulses. It’s difficult to say what the take-away is from a creative experience – especially one where you have had so much input in the creation. Overall, I would say, the ways of working: inspiring different dancers to deliver, honing a specific technique to a threshold level for a large company, a certain kind of professionalism in every sphere – something that sadly does not exist in India (it does in a dancer’s discipline but not in the larger community or the infrastructure surrounding the dance world),… so many things. I have grown as a choreographer, artist, teacher, creative partner and collaborator, and take all this back with me to my work with others and my company in Calcutta. VB: Could you discuss the process of collaboration in Helena Waldmann’s “Made in Bangladesh”? Tell us about the role you played in its development and staging. VI: This was my first project as co-choreographer. Previously, all performance projects have been my own, as director and choreographer. This was the first time that I was attempting to fulfil someone else’s vision by working with a form that I knew very well and which the director did not. In terms of collaboration, it was an equal and easy one. This does not mean that there were no differences in opinion. But Helena and I were both very open to hearing and exploring different points of view, debating, trying different avenues, and then deciding what works best. Often, these decisions took days, and were changed several times – something that the dancers (who are more used to a fixed choreographic structure rather than generating material through constant improvisation) found difficult to comprehend and absorb initially. My role covered various aspects. I was training them in aspects of Kathak to reach a similar level of understanding and technical standard. There was the constant generation of material through improvisation using specific and isolated elements of Kathak: footwork, spins and hand gestures. The isolation of elements is not natural to Kathak. This was usually in response to Helena’s ideas – what she wanted the scene to be, the mood and texture she was looking for, or what she wanted to communicate. For instance, we found that the more graceful, lyrical and expressional aspects of Kathak did not suit the production at all. But we could only discover that after having tried it in various ways for various things, and then throwing it all out. My role covered a sort of translator between Helena and the dancers, not only in terms of spoken language, but also in terms of intent. Since the working systems and creative processes are so different in Bangladesh within a certain Kathak milieu, it became imperative for me to try and convey the intent of the creative processes, impulses, and decisions so that the dancers could understand, appreciate and contribute to the journey and not get lost in confusion. As the piece progressed, I was drafted into an off-stage and on-stage role – something that was not planned until the process of rehearsals indicated to Helena that this would be a good dramaturgical choice. VB: I understand that you founded your own dance company, Ranan Core Group which “grew out of an immediate need to demystify Indian classical dance and make it accessible and enjoyable for larger audiences.” On that note, I wonder if you could elaborate on the differences and similarities you found in terms of approach during the working period for “Made in Bangladesh”? Considering that you are classically trained in Kathak and at the same time, a choreographer having to work with another choreographer? VI: I have a no-holds-barred approach to using Kathak in choreography. “Made in Bangladesh” took it to another level because I was working with a person that brought in a fresh perspective. My work has always attempted to reach large audiences without compromising on artistic or technical dance quality. I think the greatest difference in approach was not with Helena – but with the dancers. The twelve dancers come from various backgrounds and levels of experiences – so to work towards an ensemble work was a big challenge. Additionally, their dance orientation has been very structured. There is music, a choreographer comes in and creates the dance to the music, teaches and rehearses it, perhaps makes a few changes here and there – and it’s ready. This open space where nothing is fixed – no script, no music, no movement… nothing – was an approach which was extremely difficult for them to come to terms with. They were constantly trying to learn and fix things – and of course, things change from day to day. Nothing was ever fixed. Even today, we make changes from time to time, but they have learned to enjoy it. I’ve always worked in this exploratory, unfixed until the last minute kind of way with the performers in my own company – even changing things two hours before a performance – so for me that was a familiar and exciting ground. What I learned with Helena was the importance of giving time for something to emerge; to repeat something, to go beyond a fatigue point until a sort of sub-conscious, liminal space takes over, which you could never have imagined: the approach of abstracting elements of dance to a great degree, where they become completely metaphorical not representative, interpretative or decorative; and the ability to convey a clear narrative and make a political point without telling any sort of linear story. While Helena is the Choreographer and I, the Co-choreographer, our roles were clearly defined. Her role was very much the larger picture, the scenario, the kind of spacing and image she wanted to create on stage, while mine was very much the actual creation and development of movement material in response to and contributing to these impulses. 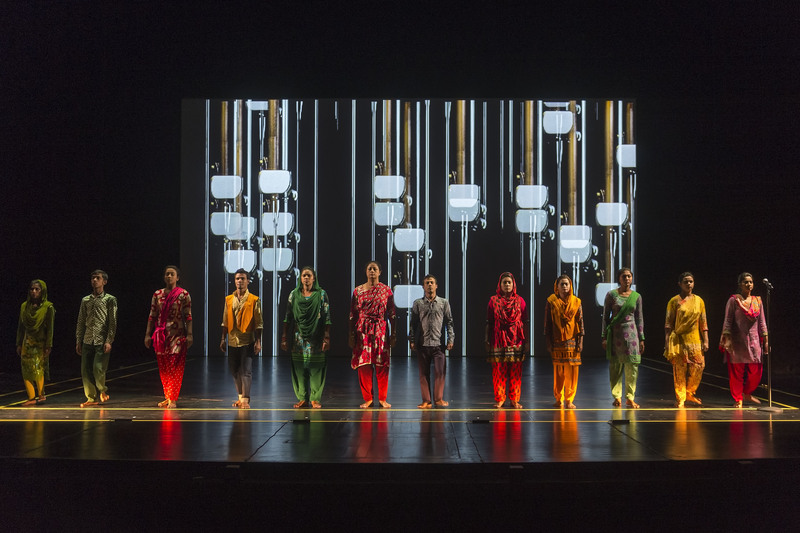 VB: Throughout the performance, the main dance vocabulary used was Kathak greatly contained with the form and body of contemporary dance theatre –where powerful visual imagery, movement, dance, dramaturgy and personal stories were articulated. To what extent would you say, did this work crossed boundaries? I’m referring not only to the boundaries of classical Kathak but in terms of working across these artistic disciplines? Working with the Bangladeshi dancers? W ith a German choreographer and staff? VI: I would like to make clear that I do not use the term ‘classical Kathak’. There is no such thing as it automatically assumes that there is something called ‘un-classical Kathak’. This is a new term that is being bandied about today – I have no idea why. What boundaries are being imposed, what is being protected? If one says traditional Kathak repertoire or recital, that still makes sense because you are referring to a manner and content of presentation – but classical Kathak as a form is ludicrous. Working in Bangladesh was extremely different from working in India because of the level of exposure and dance training available. While we complain about the situation in India, compared to Bangladesh we are far better equipped in terms of infrastructure. The quality of training we have access to, the diversity of influences and approaches (national and international) we engage with. This does not automatically translate into better dancers – though it should! But there are many references and assumptions I can take for granted working with dancers in India, which was not possible for me to do in Bangladesh. It is an Islamic country though not a very strict one. I find it more Bengali than Islamic, something I’m very comfortable with. But simple things like the physical distance and relationship between men and women, which I take for granted in India – at least in the milieus I have worked in – cannot be assumed with the same ease in Bangladesh. Working with a German company taught me a lot in terms of professionalism, delegation of job responsibilities and production management. It also taught me that they have a difficult time working in chaotic conditions – something that Bangladesh has surfeit of! VB: What is your most memorable and valuable experience about this project so far? What was it like to perform and tour in Germany and Europe, and then in India, Bangladesh? How would you describe/compare the public’s response to it? VI: We premiered the work in Germany. Then we toured in Switzerland and Luxembourg and brought the production to India and Bangladesh. In Europe, I think the quality of socio-political engagement of audiences is deeper. They were genuinely interested in the topic – whether for or against or undecided – and the animated post-show discussions prove this. The European audience appears to be fascinated with Kathak. It was a completely new way of using the body for these audiences. In India and Bangladesh, the audiences focused more on the form than the content. They know Kathak. 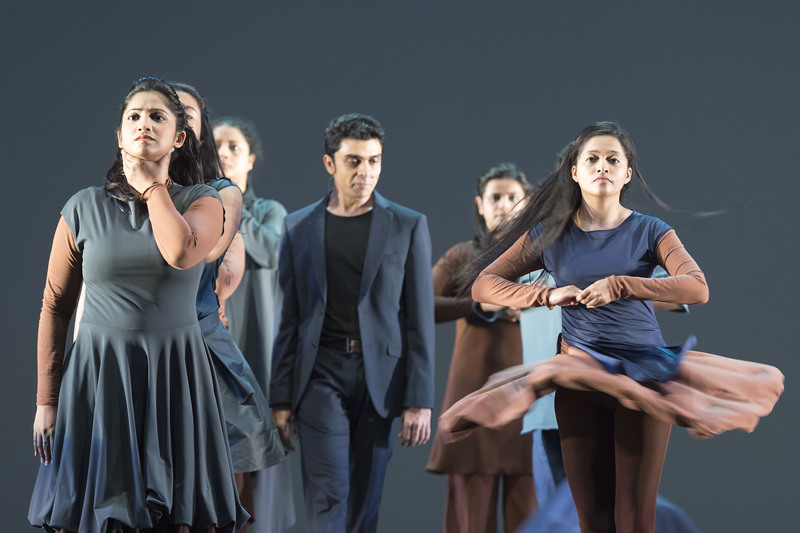 So for them, how it was used to convey the theme, the choreographic and dramaturgical construction, the technical details and innovations, the departures from Kathak expectations, and of course the quality of the dancers – these were the points which came to the fore for audiences here. How much of a political point it succeeded in making in Bangladesh, I am actually quite doubtful of – but that is another matter.